Honda has one of the most respected reputations for engineering and quality in motorsports, so we expect great things from its UTVs. This month we test Honda’s most expensive Pioneer, the 1000-5 LE with available seating for five, to see if it delivers. Honda’s I-4WD traction control delivers traction like a locked front differential without the need to stop and select differential-lock mode, and there’s no extra steering effort or a speed or rev limiter. Prices start at $16,699 for the Pioneer 1000-5 and range to $20,899 for our test machine, the Pioneer 1000-5 LE. The three-seat Pioneer 1000 starts at $14,499 and goes to $20,299 for the LE. Can-Am’s Defender Max XT HD10 is $19,099. The Polaris Ranger Crew XP 1000 Sunset Red Metallic is $17,499. Textron’s Stampede 4X is $15,999. WHAT MAKES THE LE STAND OUT FROM OTHER PIONEER 1000s? LE 1000s have I-4WD traction control, Fox QS-3 shocks, hill-start assist, electronic brake-force distribution, Matte Gray Metallic painted bodywork, power steering, aluminum wheels, aluminum skid plate and A-arm guards, red springs and A-arms, under-dash storage, additional cup holders and illuminated switches. A 999cc, eight-valve, inline, two-cylinder Unicam engine with 72 horsepower. The twin-cylinder Unicam engine is similar to the single-cylinder engines used in Honda’s motocross bikes and the 450R sport quad. A single cam operates the intake valves directly and the exhaust valves with roller rocker arms. 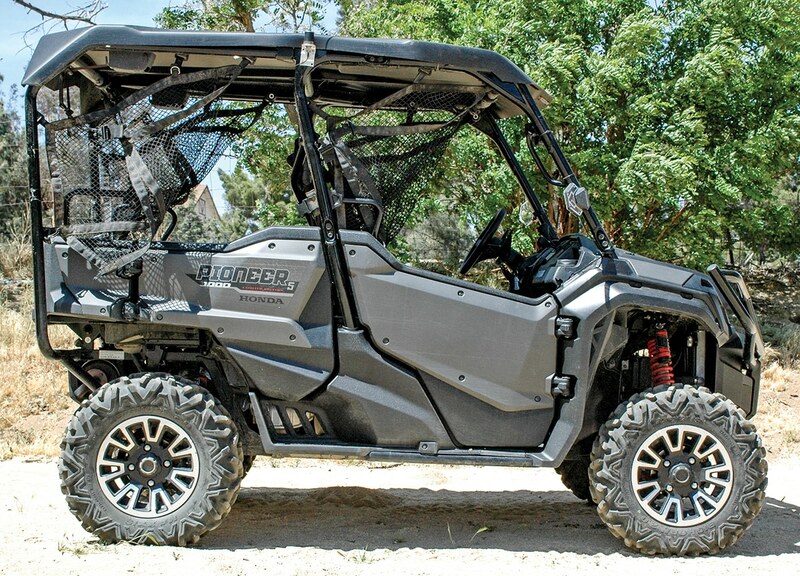 The Pioneer 1000-5 shares the same platform and 80.2-inch wheelbase as the three-seat Pioneer 1000, which makes it the tightest-turning four/five-seat UTV. WHAT KIND OF TRANSMISSION DOES IT USE? 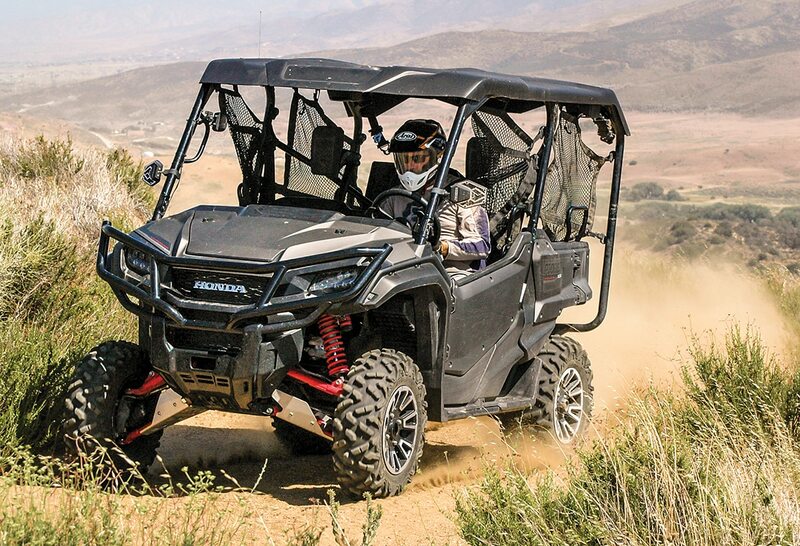 Rather than a belt-type automatic transmission like most UTVs have, the Pioneer 1000 has a geared six-speed dual-clutch transmission with automatic and manual shift modes. 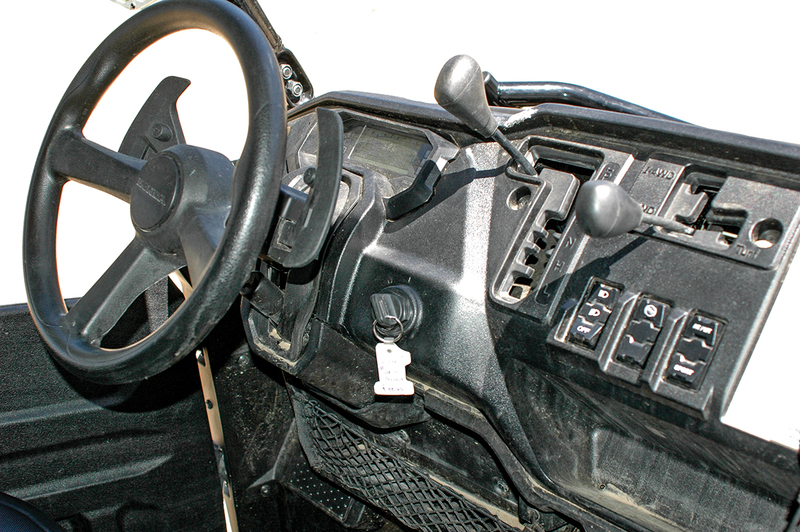 Standard and sport shift programs are available in automatic mode. Manual shifting is done with sports car-like paddle shifters, and low- and high-range gears can be used in all modes. A memory feature retains the mode you select after engaging reverse. IS HONDA’S I-4WD SYSTEM UNUSUAL? Yes. Most UTVs have 4WD systems with selectable 2WD/4WD and a front differential-lock mode, or an automatic-locking front differential. The Pioneer’s I-4WD uses an automotive-style traction control system to provide traction like locking front differentials without the need to select front differential-lock mode. The Pioneer 1000 also offers the option to lock the rear differential or leave it open for tighter turns or delicate turf. I-4WD also provides electronic brake-force distribution, which regulates the braking force applied to the front and rear brakes to match load and traction conditions. The system also includes hill-start assist, which momentarily holds the brake to stop the vehicle from rolling back on hills when you switch from the brake to the gas pedal. The Honda’s 999cc, single-overhead-cam, eight-valve inline twin makes plenty of easy-to-use power and sounds great doing it. For a recreation UTV, this thing moves. It should; it’s a 1000. It’s not the fastest machine in its class, but the silky, quick-revving engine and the transmission’s crisp shifts make the way it accelerates more exciting than some other recreation machines. It tops out at 62 mph. If you want the quickest acceleration the Pioneer can produce, it’s hard to beat the transmission’s automatic sport mode. The transmission’s many modes let you choose the style of power delivery you want, and the 1000’s smooth, free-revving engine always offers plenty of power and control. Having the option to shift or not is fun, because picking your own gears works better for some trails and situations, though automatic sport mode worked best for most of the aggressive driving we did. Standard automatic mode is the smoothest for cruising, and the shift points work well, even in challenging terrain. 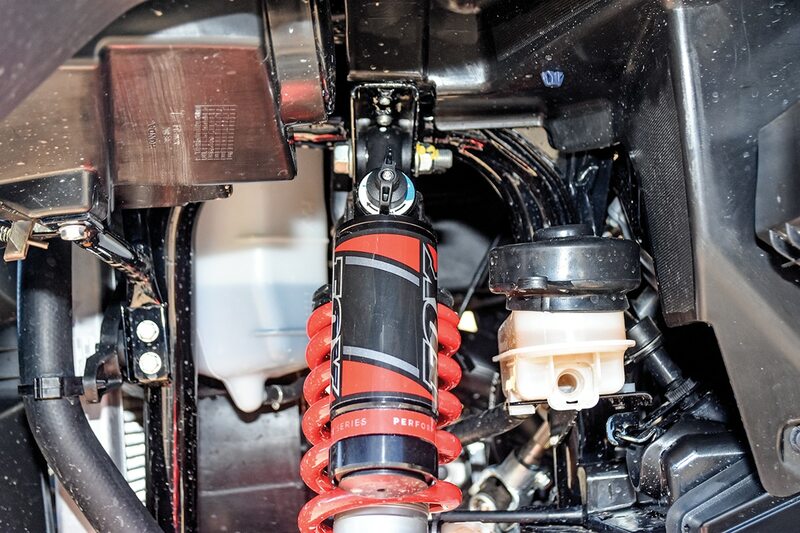 Fox QS-3 front and rear shocks have easy-to-use, three-position compression-damping adjusters. Double A-arms front and rear with piggyback-reservoir Fox QS-3 shocks that offer adjustable spring preload and simple three position-compression-damping adjustment. There’s a rear sway bar to reduce body roll. Travel is 10.6 inches up front and 10 inches in the rear. Non-LE Pioneer 1000-5 models have self-leveling rear shocks and non-reservoir front shocks that are only adjustable for spring preload. Suspension action on non-LE Pioneer 1000-5s is very good, but the LE’s suspension delivers more comfort and the ability to drive more aggressively. The Fox shocks are a little more compliant than the standard suspension on small impacts and also offer better bottoming resistance for big ruts and G-outs. Simple three-step compression-damping adjustment lets you tune the ride to the conditions you’re in and the driver’s preferences. The six-speed transmission has standard and sport automatic shift modes, or it can be shifted manually with paddle shifters. High- and low-range gears are available in all modes. 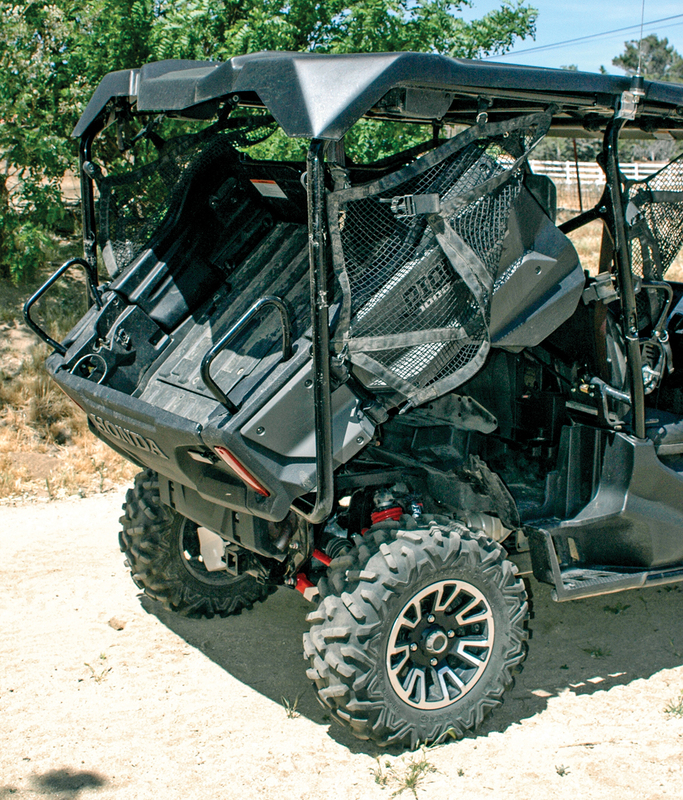 It’s impressively agile for a five-passenger recreation UTV. 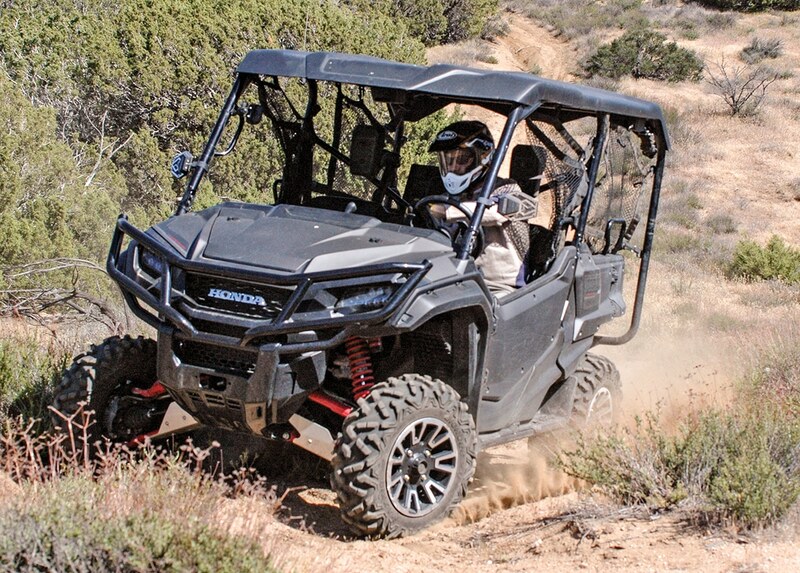 The Pioneer 1000-5 shares the same platform and 80.2-inch wheelbase as the three-seat Pioneer 1000, which rules in tight conditions and on twisty trails. The Honda is stable and well-planted in steep, uneven terrain too. HOW DOES IT HANDLE HILLS AND OTHER CHALLENGING TERRAIN? Like a boss. With the 1000’s power and 4WD system, steep, tough hills; deep ruts; and other challenging terrain are just entertaining sections of the trail rather than obstacles. Honda’s I-4WD provides maximum traction without the need to stop and select front differential-lock mode or extra steering effort. The Honda finds grip amazingly well in difficult terrain. 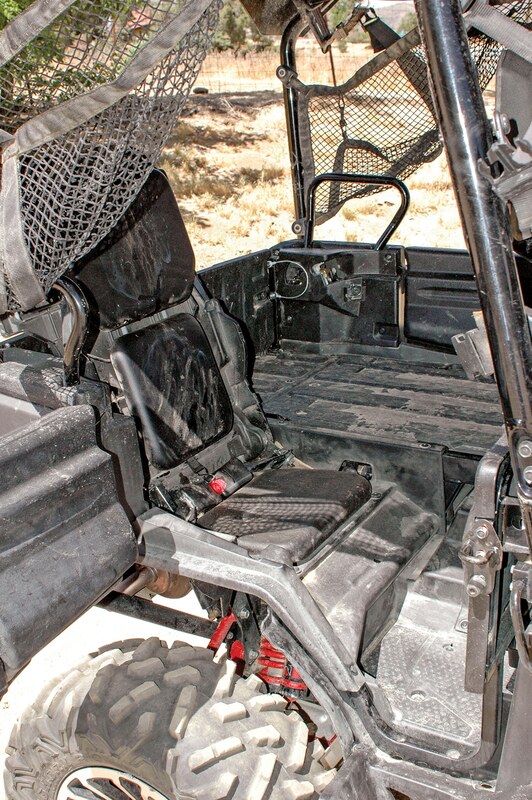 We only found one giant UTV swallowing rut where a conventional locking front differential may have performed better. If you need to stop on a hill, the hill-start assist feature makes getting moving again simple. The LE also makes going down difficult hills easy with its natural four-wheel engine braking (in four-wheel drive) and the sure-footedness of electronic brake-force distribution. The Honda can tow 2000 pounds and carry 1000 pounds in its bed. Unlike many multi-passenger UTVs, the 1000-5’s bed tilts. IS IT AT HOME IN MUD AND WATER? Yes. The power and traction that help the Pioneer master hills give it impressive mud- and water-crossing capabilities, and the bodywork provides plenty of splash protection. The Honda has more than a foot of ground clearance, and its engine intake is up high, under the hood, to deal with deep, rutted bogs. IS IT A GOOD WORKER? The Pioneer’s work credentials are very impressive. This machine can tow 2000 pounds and carry 1000 pounds in its cargo bed. 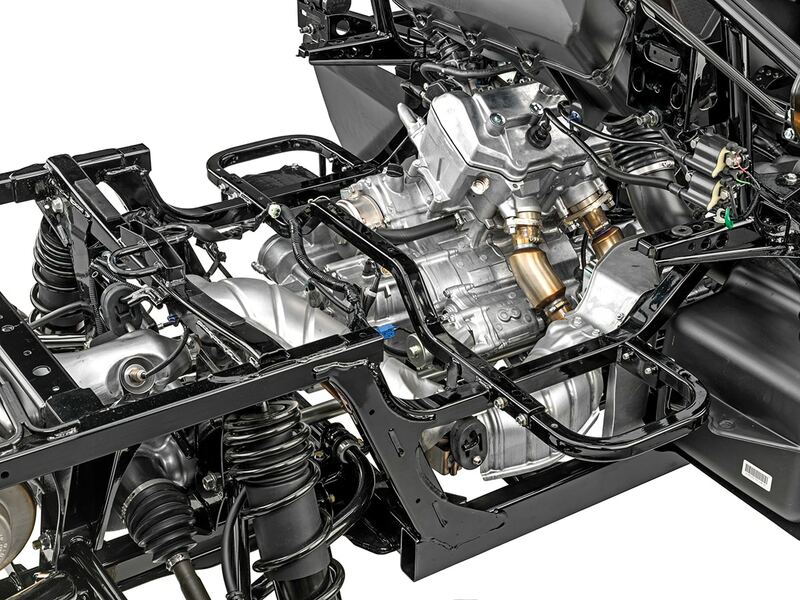 The belt-less, geared transmission is well-suited to hard towing and hauling jobs, too. Honda’s QuickFlip seating, which lets you configure the 1000-5 to seat three, four or five, gives you the seating area and bed space you need. HOW ARE THE DETAILS AND COMFORT? Nearly everything is impressive. Honda’s Quickflip seating, which lets you configure the 1000-5 to seat three, four or five is ingenious, but rear row seating is pretty tight for large adults. The bed tilts with the seats folded flat. The 1000-5 LE is so well-equipped in general, it seems odd that it doesn’t come with a roof. We added Honda’s hard roof, a $563 accessory. The Honda’s engine and transmission are outstandingly quiet, which makes every mile a little more enjoyable. The LE’s lighted switches and extra cup holders are welcome additions to the well-laid-out cab. 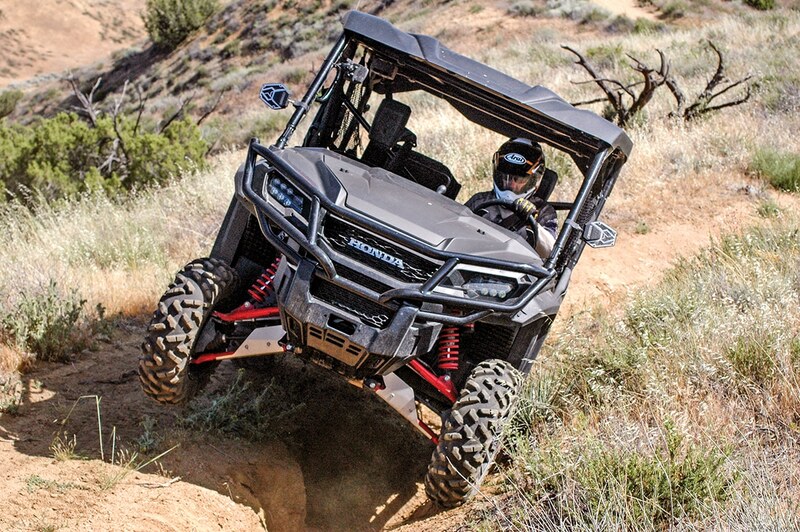 We expect excellence and innovation from Honda, especially in its top-of-the-line UTV, and the Pioneer 1000-5 delivers. This machine has one of the most refined engines in UTVing; an exceptionally rugged, versatile transmission; excellent suspension; handling and comfort.